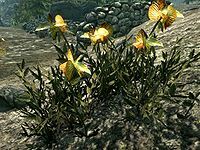 Dragon's Tongue is a conspicuous yellow-flowered plant found growing in Eastmarch's volcanic tundra. It is also sometimes grown as an ornamental plant. It is one of only three ingredients with a Fortify Two-handed effect. Dragon's tongue is one of 4 items needed at the Atronach Forge to create a Spell Tome: Conjure Flame Atronach. This page was last modified on 9 April 2018, at 04:00.